Less than an hour north of Byron Bay, Coolangatta offers visitors a quiet seaside escape. It’s the perfect day trip from Byron Bay to experience some great beaches, fun activities and good food. Named after the schooner “Coolangatta” that was wrecked there in 1846, Coolangatta is Queensland’s most southerly coastal town, just on the edge of the Gold Coast and Northern New South Wales. Coolangatta and Tweed Heads are called the “Twin Towns,” with Coolangatta part of Queensland and Tweed Heads in New South Wales. There’s even a border marker showing where each state ends. Coolangatta is also home to the Gold Coast’s airport. Fun fact: In the summer, there’s a time difference between the Twin Towns so you can actually celebrate New Year’s Eve twice with just a hop, skip and a jump. But you’re not here for a history lesson, you want to know what are the best things to do in Coolangatta; how great is the beach, what are the best attractions and where can I get some great grub? Don’t miss out on gorgeous Coolangatta Beach. Relax on the beach, take a swim or surf (if that’s your thing). There are a variety of levels of surfing available in the area from the gentler breaks at Greenmount Beach and Rainbow Bay, to the more expert surfing that can be done at Point Danger. Snapper Rocks is another popular surfing destination, where you can almost always count on good conditions. The Quicksilver pro surfing tour is held there every year, most likely because it has some of the best barrels on the Gold Coast. If you need lessons, head down to Greenmount Beach, just down from Coolangatta, and hook up with Walkin’ on Water for a surf lesson. Perhaps you’d prefer to get underwater rather than stay above, so you need to look into snorkelling or scuba diving. A great site for diving is the Nine Mile Reef, located off Tweed Heads. If you’d like to see a shark, then you’ve come to the right place. Here you’ll find wobbegongs, blind sharks and bronze whalers throughout the year while you might catch sight of grey nurse sharks in the winter and leopard sharks in the summer. The reef itself is about 10 metres deep, going down to 30 metres. In the shallow section, you’ll likely come across reef fish, turtles, stingrays and eagle rays. Check out Dive Queensland for all the information you need on locations and diving in the area. If you’d rather not get into the water, then try to visit Coolangatta during whale migration season. Here, you’ll have your best chance of whale sightings in August and September. Consider going on a tour with Coolangatta Whale Watch, which departs daily from Coolangatta & Tweed Heads Golf Club Private Jetty. Take a 3-hour cruise to see Humpback whales, and occasionally Southern Right whales, Minkes, Orcas, and Pilot whales. Sightings of Bottlenose dolphins are also common, sometimes before even leaving the jetty. An option for the whole family, Catch a Crab half day tours are a fun way to spend a morning by feeding fish, hand feeding friendly pelicans, catching mud crabs and more. All equipment provided as well as morning tea. Tours leave at 9:30am daily. You can either do the tour with or without lunch. With lunch, you can do a family package for $230 that includes two adults and two children, or for without lunch it’s $55 per adult and $36 per kid (3-14). The tour will take about three hours, so you’ll want to factor that in if you’re planning your day in Coolangatta. If you can manage to get here early or stay late, think about bringing a picnic breakfast or dinner to catch the sunrise or sunset at the Kirra Hill Lookout. The lookout, which is watched at all times by the iconic iron eagle sculpture, not only allows you to view the beach and surrounding headlands, but on a clear day you can see the coastline up to Main Beach and down to Snapper Rocks. Without trees, the view is unobstructed so you can get an amazing look at that sunrise or sunset. Plus, if you’re ambitious, then you can bring some food that you can make on one of the two electric barbecues available and eat while relaxing at the tables under the shelter. A fun activity to catch if you happen to be in Coolangatta on the second Sunday of the month is the Art and Crafts Market, which takes place from 8am to 2pm in the Queen Elizabeth Park, right next to the beach. You can wander through the 150 or so stalls of crafts, fresh produce, preserves, cookies, cakes, homewares and much more. It is connected with the markets in Broadbeach and Burleigh, and each location usually hosts live music each Sunday. Check out the market’s Facebook page for updates. Another fun activity in Coolangatta is to explore a section of the Queensland rainforest on a cruise along the Tweed River. Rainforest Cruises has three cruise options ranging from crab catching to surf ’n’ turf lunches on rainforest cruises along the Tweed River for two hours. Drive up to Coolangatta early (if you skip the early picnic at Kirra Lookout), then check out this list of breakfast spots. You could combine checking out Rainbow Bay beach area with a trip to the excellent Little Mali. It’s not really a hang out spot since there isn’t much seating so it’s the perfect place to grab coffees and some delicious breakfast options and head to the beach. Bellakai, located across from the beach, it’s suggested visitors should try the tempura prawns. For the end of the day, if you don’t have the kids with you and are travelling with friends or older family or just you and your partner, then consider heading over to the Cellar Door at Coolangatta Estate where you can taste excellent local wines and even add in your own platters of fish, meat, cheese and olives. Stop by Earth ‘n’ Sea Pizza and Pasta for a delicious pizza and perhaps a beer to end your trip to Coolangatta if you’re looking for more casual, family-friendly options. Voted the Best Pizza Restaurant on the Gold Coast, Earth ‘n’ Sea lists 20 gourmet pizzas on its menu (as well as a half and half where you can combine two of them) in addition to pasta, burgers and salads. 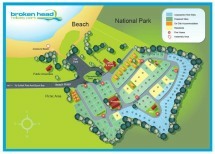 Make Byron Bay your home base as you take advantage of a great price and location at Broken Head Holiday Park. Here you can set up shop and not only see the sights of Byron Bay, but take in the many amazing day trips that can be done from here. Read through our blog, we offer tons of suggestions on day trips from Byron Bay so you’ll be sure to soak up all the area has to offer.